Have a Magical Christmas with them! Starting tomorrow and this ad is set to publish on the 11th Dec on MyPaper! Tis the season to stay Fabulous! 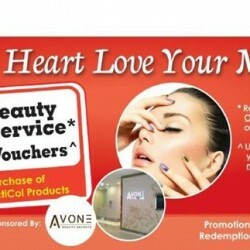 Be pampered and preen with confidence only at AvonE Beauty Secrets. Love your heart Love your mum! Celebrate Mother's Day By Feeling Good And Looking Fantastic! Stock Up With Nestlé Omega Goodness & Enjoy One FREE Session Of Customised Brows Shaping Or Express Manicure! And Get To Offset $20 Off On Your Next Beauty Treat! Valid From 1st May Till 30th May. 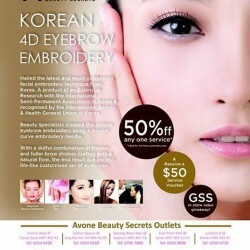 Only At AvonE Beauty Secrets. Celebrate With them And Pamper Yourself! Enjoy $50 Off Any One Service! T&C Apply. 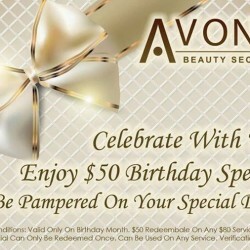 Birthday Special Redeemable For Any One Service. Redeemable Once Only On Your Birthday Month. Verification Is Needed. T&C Apply.